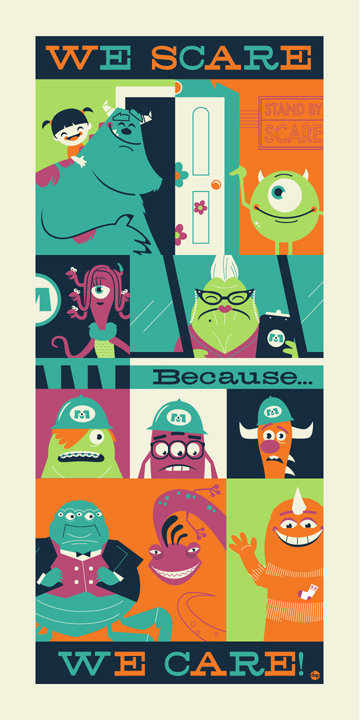 This is one of my pieces that debuted today at the brand new WonderGround Gallery at Disneyland’s Downtown Disney. Here's a little info about the gallery. 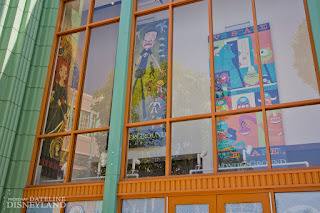 WonderGround Gallery is distinctive, eclectic and uncommon! Opening June 9, 2012, this contemporary setting is, in itself, a blank canvas, providing the ultimate venue where unique art collections, works from a new generation of artists and unexpected finds in home and lifestyle merchandise, take center stage. Find more details about this new gallery on the Disney Parks Blog or www.ArtofDisneyParks.com. Also, here's a pic from the outside of the gallery. You can see a really large banner featuring my art. 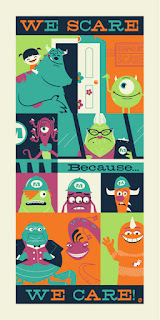 We love your Monsters Inc. piece for the WonderGround Gallery. You are a true artist and we love your work. We have one of your pieces already and would love to keep adding to our collection. Can't wait to see more! I'm becoming a true fan of your work. Is there any way to obtain this print without going cross country to Disneyland? I swear I saw some of your prints at an Art of Disney store in Orlando's Downtown Disney at the beginning of this year...anyway- love them! I'm very much fond of retro travel posters and Mary Blair and your art combines a lot of those style with your own flair. I look forward to following the blog and seeing more of your art. I got a copy of the poster, matted, at Wonder Ground recently (always loved it, and finally decided to get it for my office :-)). One question: How do you recommend hanging it? My understanding is the poster, with matting, is 14x18in, correct? Should I get a frame for it, or not get a frame and instead use something else to hang it? Sorry – I really want to display it properly, and am not sure the best way to do so, keeping it in top shape.